A thrilling glimpse into the next likely global contagion---and how to stop it. 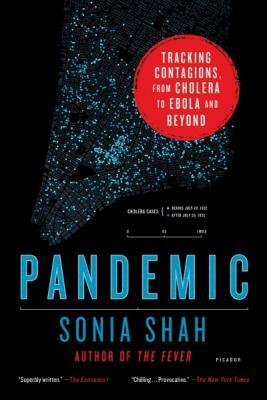 In Pandemic: Tracking Contagions, from Cholera to Ebola and Beyond, prizewinning journalist Sonia Shah reveals how that could happen, by drawing parallels between cholera---one of history’s most deadly and disruptive pandemic-causing pathogens---and the new diseases that stalk us today. As Shah traces each stage of cholera’s dramatic journey from harmless microbe to world-changing pandemic, she reports on the pathogens that have followed cholera’s footsteps---from the MRSA bacterium that besieges her own family to the never-before-seen killers emerging from China’s wet markets, the surgical wards of New Delhi, the slums of Port-au-Prince, and the suburban backyards of the East Coast. A true story that is both gripping and alarming, Pandemic delves deep into the convoluted science, strange politics, and the checkered history of one of the world’s deadliest diseases, offering a prelude to the future that’s impossible to ignore. Sonia Shah is an investigative journalist and the critically acclaimed author of The Body Hunters: Testing New Drugs on the World’s Poorest Patients and Crude: The Story of Oil. Her writing has appeared in The Washington Post, The Boston Globe, New Scientist, The Nation, and elsewhere.